On September 8-10, 2017 members from Somerset Fire & Rescue, Elizabeth Avenue Fire, Community Fire/Rescue, Franklin Township Office of Fire Prevention and Franklin Park Fire attended a 3 day course on structural collapse training hosted by Somerset Fire at the Somerset Firehouse. This 3-day class conducted by Safety and Survival Training LLC. This multi-day training covered the skills to certify the attendees to the awareness and operations level. All of the members from the different departments worked seamlessly to make this class an enormous success. We look forward to having S&ST LLC. back soon for future classes. This week’s duty crew drill focused on the Paratech Raker Shore System. The crews setup the raker shores to get some real hands on experience in this very technical operation. Great work by the crews this week! 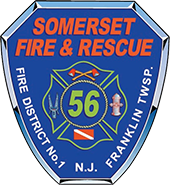 Somerset Fire and the Somerset County Prosecutor’s Dive Unit trained together at Donaldson Park. The teams from both units worked together and used this valuable opportunity to home their skills and familiarize themselves with each others operation and equipment. Somerset Fire and the Prosecutor’s team work together often and used this time to further our relationship. Station 56 and The South Bound Brook Fire Department (Sta.55) attended a joint drill on boat operations and water rescue at Donaldson Park. The drill allowed our members to work closely with the members of Station 55 and familiarize themselves with each others equipment, boats and water rescue operations. Once again a great training opportunity to work with our neighboring departments. Members of Somerset Fire & Rescue practiced some more advanced vehicle extrication techniques during this drill. This training concentrated on extrication of vehicles in unusual positions. This drill required the use of advanced stabilization to make the vehicles safe for patient removal. The members focused on scene safety and crew communication as a part of this very successful drill.